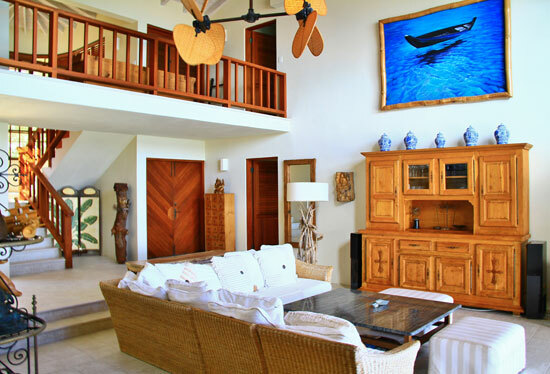 Meet Three Dolphins Villa in Anguilla. 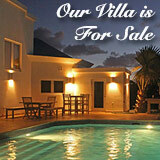 Built in 1996, it is a villa that was acquired when the owner, Chelle, saw it for the first time. 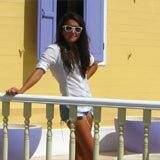 Chelle, who is well-traveled and has experienced most of the Caribbean islands, first fell in love with Anguilla back in the mid-70's. 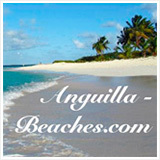 In fact, she was one of the earlier guests at Anguilla's first real hotel, Rendezvous Bay Hotel (RBH). She can share many inspiring stories as told by the founders of RBH, Jeremiah and Lydia Gumbs. 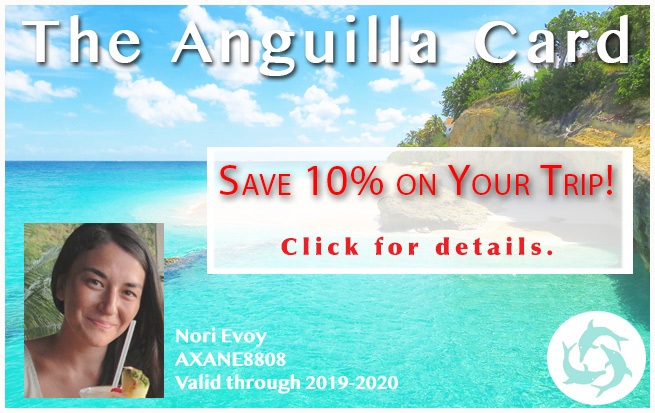 She returned year after year and always felt Anguilla had something special that the other Caribbean islands did not possess. 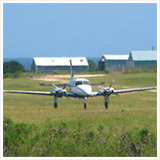 Those of you who've been to Anguilla may know about this feeling you get from the island. 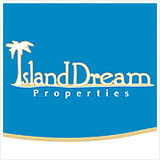 After deciding to make Anguilla her home, she connected with our friend, the humble and honest, long-time Anguilla real estate pro, Jackie Pascher with Island Dream Properties. She and Chelle looked at villas for purchase. If you have the pleasure of seeing Three Dolphins villa in person, you'll know exactly what I mean. While there are some nice photos of Three Dolphins, this is one that you really need to see in person in order to fully appreciate it. 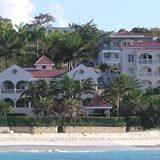 First, you should know that Chelle has put quite a touch on this luxury villa that is located on the southern shore of Anguilla, not far from Blowing Point and overlooking and St. Martin. 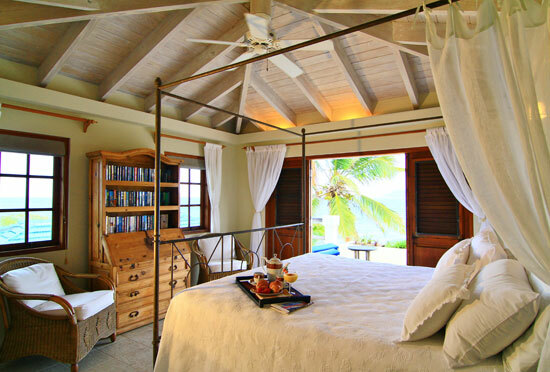 While it is immaculate and stunning in its exclusive Caribbean Seafront setting, it feels very comfortable - like home. As you enter through the front gate, you walk through a whimsical garden. What's special about this garden to me is that the trees max out at elevations well overhead. This is not very common in Anguilla. Sometimes when a home or building is about to be built, the property is razed to start work. The builders of Three Dolphins were full of foresight in allowing most of the existing trees to stay in place as the home was built. The result is the feeling of a lush grove as you enter in to Three Dolphins. Chelle's husband is a master at wood carving. His work is abundant in the garden and dotted throughout the villa. His hand-made pieces of furniture and decor compliment the plush furniture of the home. 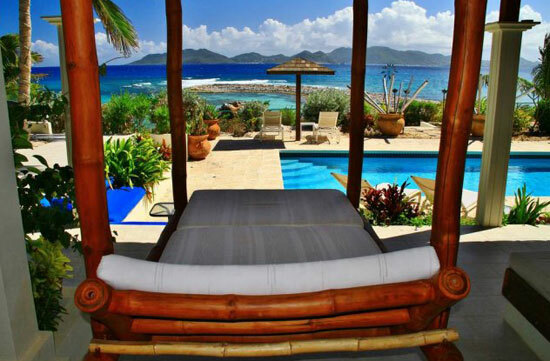 A highlight of his handy-work is the oversized porch lounge, referred to as the "bamboo bed". It is excellent for naps or for even pulling an all-nighter by the sea. This villa is stellar for entertaining, Chelle has made sure of it! The area around the pool provides plenty of shelter and sun. 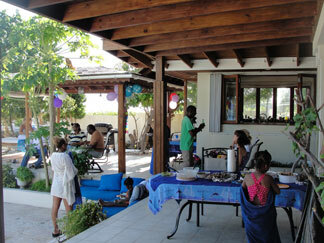 The position of the gourmet kitchen, near the pool, grill and outdoor covered seating, is ideal for groups of all sizes. 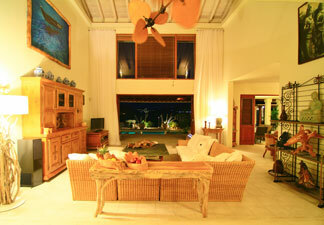 Regarding size, this villa consists of 5 bedrooms. Three of the bedrooms are king size suites with baths and walk-in closets. The other two bedrooms are furnished with twin beds and share a bath and indoor/outdoor shower. One of those bedrooms can easily be converted to a king bedroom. 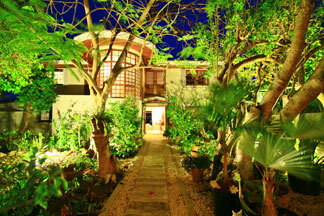 The villa at night overlooks St. Martin lights! If you're interested in it as a vacation rental and don't need that many bedrooms, Chelle accommodates those needs. She'll rent the home as a 1 bedroom and on up to a 5 bedroom. The kitchen is not far from a formal dining room or casual eating areas. There is a library which offers a little privacy as the atrium and living room area are very open, as they should be in the Caribbean. The tradewind breeze is lovely at Three Dolphins! The kitchen is fully equipped and there is a reading/audio/video library, cable TV and a fax machine and internet. The freshwater pool is accompanied by a jacuzzi. 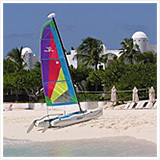 Beach chairs and umbrellas are on hand as is water sports equipment such a kayak and snorkeling gear. 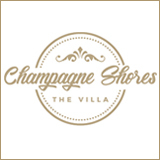 Housekeeping and grounds staff are at the villa on a regular and daily basis and many additional arrangements can be made, such as a personal chef, a masseuse, car rental, babysitting services and more. 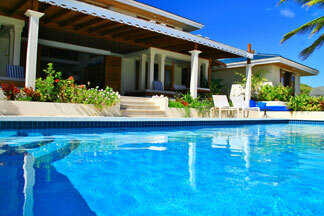 At Three Dolphins you could spend your day between the pool and the sea. 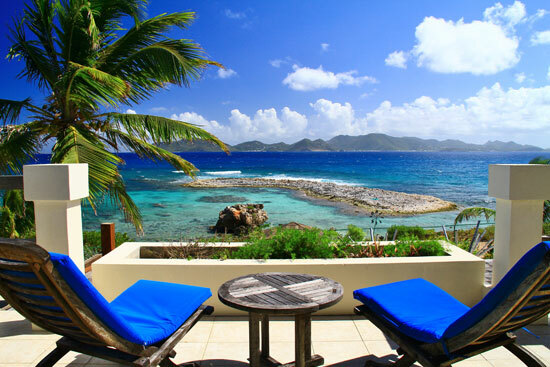 The pool overlooks the Caribbean Sea and St. Martin. 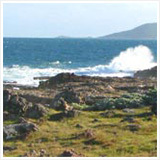 Just steps away is the beach area which is about as private as it gets. I'd be slighting the amazing feel and beauty of the villa if I didn't mention Chelle's wind sculpture. Mounted on the sea side of the pool is this special, hypnotic copper work of art that resembles a flower. The breezes transform the shape of the sculpture with movements that are ballerina-graceful. I'd never seen anything like it. It's likely wise not to get one for my own home as I might be tempted to watch it move all day. Chelle's wind sculpture can almost take your attention away from the precious sea view. 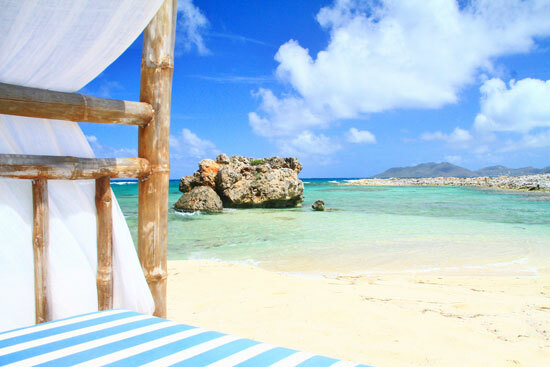 About the view… St. Martin is a straight shot across the deep turquoise water from Three Dolphins. On a clear day you can see Saba, which happens to be the island where Chelle got her wind sculpture from. You can also see St. Barths most of the time. There are true visual rewards here at Three Dolphins... everywhere the eye can see! 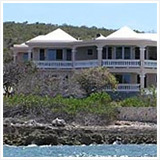 If you are looking for your special trip to Anguilla to be even more special, considering making Three Dolphins your vacation villa. Just lounging at this villa brings you to a state of relaxation, nevermind the incredible location, view and hospitality.